In the next 25 years Palmerston may grow by 1,725 people living in another 625 households. 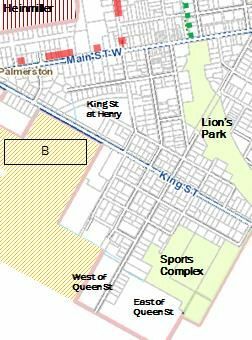 Town Council reviewed the first draft of the West Palmerston Secondary Plan August 7, which looks at how and where residential, industrial, parks and commercial growth may occur in the future, including options that might lead to changes to Palmerston’s urban boundary. A copy of the Draft Secondary Plan can be found here. Please not that the Draft West Palmerston Secondary Plan has no status under the Planning Act of Ontario. This means the meeting is an information session and not a formal public meeting leading to any immediate changes to Town planning documents. The Town is looking for feedback into future growth options heading into Wellington County’s five year official plan review in the coming years. Town staff is hosting an open house in the Community Hall in the Palmerston Community Centre Tuesday September 18, 2018 at 5:00 pm. The open house will allow members of the public to look at planning maps for the secondary plan area, pick up a copy of the planning document, and speak informally to staff about the plan. Notice of this meeting will be given in the local papers, posted on the Town website and through social media.